When Corporal Ken Bailey, a physical education instructor with the 5th Suffolk Regiment, set sail in October 1941 for the Far East he was only 21 years of age. Little did he imagine the horrors hewould encounter in the next few years as a Prisoner of War of the Japanese. To travel 20,000 miles as part of a well-trained Brigade Unit simply to surrender was shaming and disheartening to the British men even though they knew it was far from their fault. The necessary logistic support from those in Supreme Command had not been forthcoming. 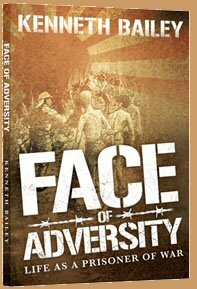 “Face of Adversity” is Ken’s story of 3 ½ years imprisonment by the Japanese. Of travelling through dense, hot and humid jungle, building the infamous Burma Railway,watching friends die in horrendous pain and conditions, having very little food, no medicines and suffering severe and inhumane punishments by the captors. How did Ken have the strength of character and will to live and return home to his family?